Home / Blog / Jackson / Why Not Select Golf? by sarahon August 9, 2012 Leave a Comment on Why Not Select Golf? Believe it or not Jack is actually getting into the age range for select sports. You know, when kids have the opportunity to “play up” or join a team of all-stars and log lots of miles traveling from tournament to tournament. He could be trying out for baseball already and soccer starting next year and those are just the ones I know of now. It seems these days kids start specializing in sports at younger and younger ages. These select teams play year round and can be a significant financial commitment too. Jim and I were talking about what sports we think that Jack would not only be good at, but also enjoy. 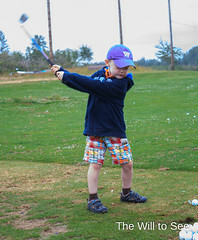 So far he has mainly been exposed to the traditional kid sports of baseball, basketball, soccer and of course golf. As his friends start to really specialize and stop playing the rec sports leagues we want to make sure he has options and understands what he enjoys. We are pretty sure he isn’t going to be a top level baseball, basketball or soccer player. But he could be a great golfer. Golf is an overlooked sport for kids. But why? It teaches a lot of good values, sportsmanship and skill. You need good hand-eye coordination and the ability to replicate a complex swinging motion the same each time. There is strategy in understanding required on how to play the holes; it isn’t always the smartest to just try and hit the ball as far as you can. Kids learn life lessons and values like etiquette, respect and patience. It is the only sport I know where referee yourself and assess penalties, even at the highest level. What a great concept – be accountable to yourself first. It is also a sport you can play your whole life and with anyone at any level. Jim’s 83 year-old father plays at least two rounds of golf a week. Through handicapping, the playing field can be leveled and anyone can compete fairly and evenly against each other. An 83 year-old can’t play baseball against a 25 year-old and have a chance at even competition. As soon as Jack has the stamina to play 18 holes, Jim and I will take him out with us. For now, we will continue to play Par 3 courses. You can get a fair amount of exercise golfing, walking the course could add up to at least three or four miles depending upon the course you play. Jack has a great swing. He has played at golf camp the last three summers. Jim started playing at 13 and has never taken a lesson, but wishes he could have started earlier. Who knows how good he would have become (he got as low as a single digit handicap before kids and has shot even par once). 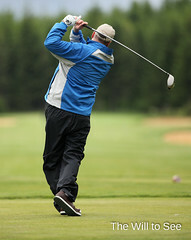 I didn’t start playing until I met Jim, but have been told I have a very natural swing. Jim actually taught me to play. We really enjoy playing and wish that we could play more together as a couple. Will is going to play too, but he is a lefty so it will require a little more thinking on our part as we teach him to swing. So I when your child is looking at sports why not try golf? 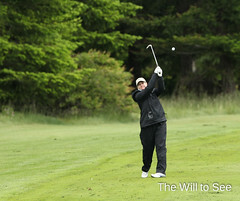 It is a wonderful sport that is fulfilling both on and off the course.